It was while I was at the morning prayer time on my last full day in Haiti that it came together for me. What a week I had had! My primary reason for going at this time was to meet my eldest daughter’s boyfriend. 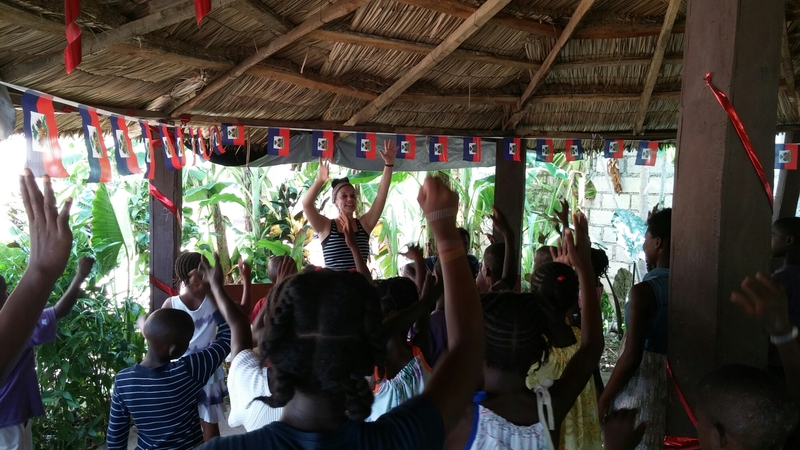 Sarah has been working with Youth with a Mission (YWAM) in Saint-Marc, Haiti, since 2009. A couple of months ago, she informed us that she met a Haitian young man, whom she thought was “the one for her.” Almost as soon as I started praying, I felt strongly that I needed to meet him. The end of July provided a window of opportunity for us all. So I went. As it turned out, a lot more happened than the planned personal goals. 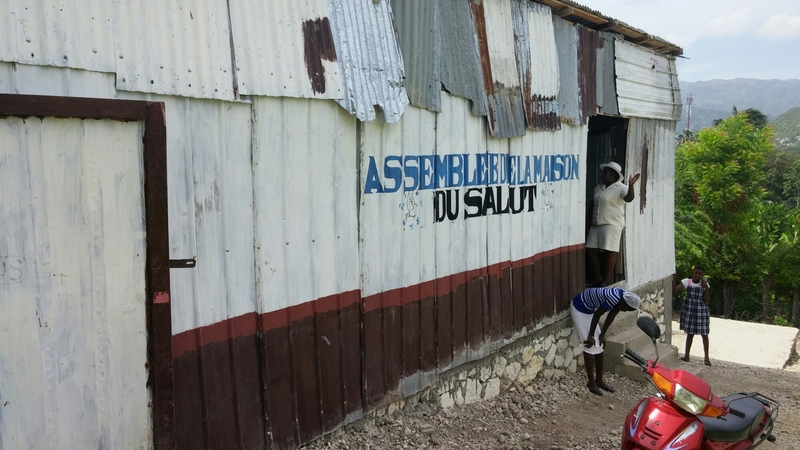 The details of what I experienced in my week there are documented in my previous Haiti posts on this blog. If you prefer to read my 2016 Haiti experience in date order first, click here (this post will then be listed at the end). This was my second time in Haiti. In 2012, my wife, Robin, and I went down, so I could teach at their annual staff conference. I had no idea at the time that the material I covered then – an overview of the entire Bible – would become the core of my teaching ministry that launched a few months later. As it turned out, Sarah wasn’t in Haiti for the staff conference. So, this time was the first time I was able to see it through her eyes. But what I didn’t know is that it would be through God’s eyes that I would see Haiti this time. The transformation in my perspective was so great I had to express it to the staff at the prayer meeting in the form of a confession. I didn’t want really want to go this time. I went out of love for my daughter and a sense of obligation to God (neither are bad reasons). Haiti is one of the world’s most dangerous countries. Infrastructure is almost non-existent and the society is extremely volatile. Then there’s the mosquito-borne illnesses and the general lack of sanitation. And it’s pretty hot in the summer with very little air conditioning. The YWAM base is generally safe, however. It’s a really nice, multi-building compound inside high concrete walls with barbed wire and armed guards. Four years ago, I was fine staying on the base most of the time, venturing out as rarely as possible. But with Sarah this time, when she wanted to take me here or there for whatever reason, I went. My transformation began just prior to my arrival. It started as the beauty of this troubled country hit me as the plane descended. What you need to understand is that I am the kind of person for whom the negative aspects of a thing tend to define it. That came in handy years ago when I worked in Quality Assurance. I was hired to find the clouds, not look for the silver lining. This ability is crucial in many situations, where quality is essential and especially when lives may be at stake. My problem is that I have seen all of life through that lens, including my closest relationships – a challenge indeed in my roles as husband and father. 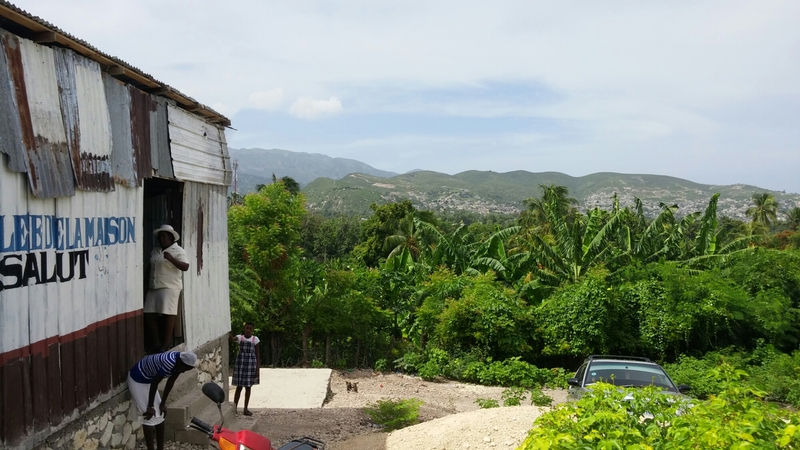 But during that descent, as I was looking at the mountains from which the name Haiti is derived, I was impacted by how beautiful they were as were the many vistas and views we encountered on the long drive from the airport to the base in Saint-Marc. Then there were the extraordinary trees and flowers, and eventually the people (again, see my blog). To my shame, all this had been eclipsed by the negative aspects of the country, which had blinded me to the bigger picture which is Haiti. For the last over four years, I have been calling people to see the world and all of life through the lens of the Big Picture of the Bible’s overall story. Essential to that is our need to understand the fundamental goodness of the creation (Genesis 1:31). While evil has tainted every aspect of life, the material world is still of God and is to be valued as the sphere in which we are to serve him. When Yeshua said, “For God so loved the world…” (John 3:16), he wasn’t referring only to people and especially not simply to the non-material side of people (their souls in other words). The Greek word for “world” in John 3:16 is “cosmos,” which in this verse’s context is the whole created order, including the physical sphere. The creation is God’s building project and he loves it so much that he sent his Son to rescue it. If we trust in Yeshua, we get to be part of his rescue plan. It looks as if it took me over four years to get my own message, especially as far as Haiti is concerned. Instead of seeing Haiti through my distorted lens of negativity, I saw a Haiti a lot more as God sees it. A Haiti that God so loved he gave his only Son on its behalf. It took a change of perspective on Haiti to show me how dysfunctional my negativity in general really was. And that is why I felt I needed to confess it to the YWAM staff – they who have been giving their lives for this beautiful country – at the prayer meeting that day. I can’t wait to try out my new eyes on my family and everyone else. Reminder: You can read my my entire 2016 Haiti experience in date order, by clicking here. Last night as I was getting ready for bed at my friend’s house in Montreal. Being in familiar surroundings since I have stayed there before, in the moment Haiti felt like a dream. The contrast of between where I had been a few hours earlier to where I was then was striking. My train to Ottawa didn’t leave until noon, so I headed out for a walk and a time of prayer and reflection. I ended up in a park by the St. Laurence River and had a wonderfully refreshing time in a most peaceful setting. And he made from one man every nation of mankind to live on all the face of the earth, having determined allotted periods and the boundaries of their dwelling place, that they should seek God, in the hope that they might feel their way toward him and find him (Acts 17:26-27). Whether you are in Canada, Haiti, or somewhere else, God in his providence had been at work to draw you to himself. What a blessing it was to get a glimpse of how God has been and is working in Haiti. That glimpse has transformed my perception of, not only Haiti, but life! Over the next few days, I hope to be able to put into words the impact of what I experienced and what it may mean for how I approach life hereon in. Thanks to those who have been tracking with and praying for me and my family while I’ve been gone. And thanks be to God for his guidance, protection, and blessings through it all. First, the voyage home will take longer than normal, because I couldn’t get a decent connecting flight from Montreal to Ottawa. So I will be overnighting at a friend’s house this evening and taking the train to Ottawa early afternoon tomorrow (Wednesday). As planned, we left the base shortly after 5 this morning. It was still fairly dark and the quietest I have seen the streets of Saint-Marc. By 6, the hustle and bustle on the main route to Port-au-Prince was at full throttle. The street in front of the mission base at 5 this morning. Down the road about an hour later. Having a lovely buffet breakfast with Sarah and Damas at a nice hotel near the airport in Port-au-Prince. The dining room where we ate breakfast this morning. A glimpse of the grounds of the hotel where we hung out this morning. A most interesting tree on our way into the hotel (if anyone can identify it, let me know). Close up of the “tassels” growing out of the tree. One more photo before heading to the airport. Seeing their faces and hearing some of them sing along to this song, just having learned how some of them were dropped off at the home with no papers, no identity, and no date of birth – total cast offs – filled me with wonder, hope, and joy. Behold how good and how pleasant it is when brethren dwell together in unity. I think we have so much to learn from these Haitian children! Sarah felt it was okay to post this photo. Now to this morning… A few days ago Sarah confirmed that I would be speaking at the Sunday service at a church in Saint-Marc led by Delson, the gentleman who was my translator when I was here in 2012. 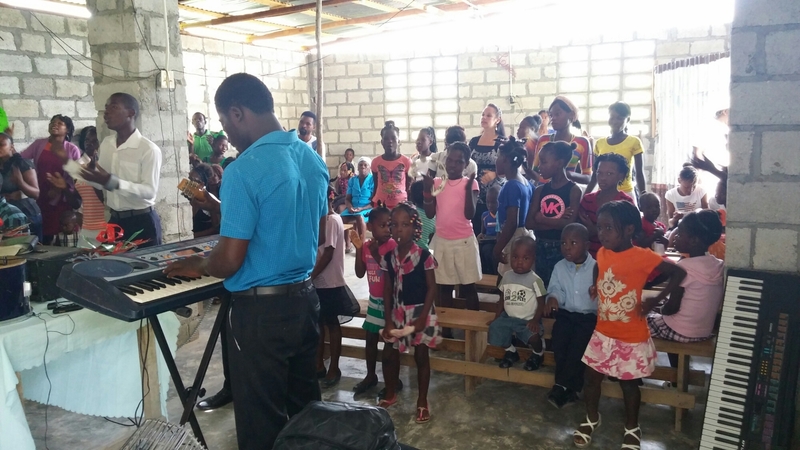 A couple of weeks ago, a friend of mine in Ottawa emailed me to say that he was going to be praying for various aspects of my Haiti trip, but not so much the teaching segments, because “You (meaning me) are used to that.” With all due respect to my friend, there is nothing routine about my Bible teaching, and that’s even more true here. In past posts I have already shared my awareness of the great cultural chasm between me and the Haitian people. If God doesn’t provide an effective communication bridge (figuratively speaking), it would all be futile. So I indeed pray. What came to mind seemed risky to me, but as the days went by, I felt stronger and stronger that this was the message I was to bring. I planned to teach on Romans 9:1-5 where Paul shares his anguish over his beloved people. While one point I wanted to get across was God’s heart for the Jewish people and to encourage the Haitian believers to pray for us, a key aspect was to explain that it was important to express the grief and sadness we may feel at times. Christians are sometimes wrongly taught that they need to be happy all the time. I wanted them to understand that there are times we all (including men) need to cry. Could you imagine how I felt when driving to the meeting, Delson mentioned to me and Sarah that his dear, dear older brother died last Sunday at the age of 45, leaving behind a family. His brother was like a father to him. This was the first indication that I was perhaps on the right track. But then on the way back, he thanked me for my talk, and said that during the service he was actually in tears over his brother and had been struggling that this was a indication of weakness, while I explained that no, God himself cries over tragedy. While we can rest in the certainty of God’s love and that we have hope beyond the grave, we need to grieve over our losses. I am so grateful to God for his leading and provision! I see myself doing this, but not sure if I believe it. 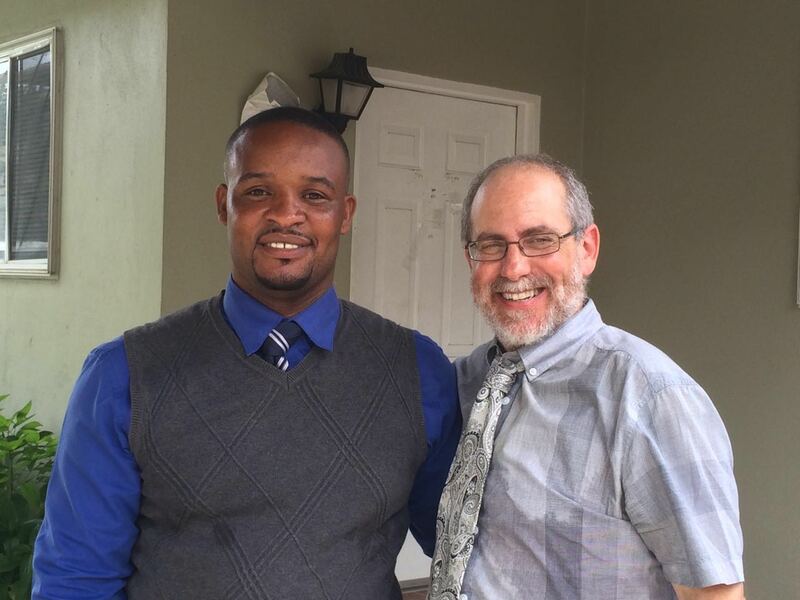 Pray for Delson, his family, and the important work he is doing in Haiti. If this evening goes as planned, I hope to share some pretty surprising photos tomorrow. Today began with a walk, something I try to do every morning back home, but my first here since arriving. As I approached the small covered stadium on the base, I saw my soccer guys from Thursday night, practicing. Then I remembered that their leader had asked me if I was available to address them again on Saturday, but knowing that Sarah had plans for me I couldn’t commit. So here was again another last-minute teaching opportunity. It amounted to a “part two” of the other night. From Ephesians 3:14-19, I spoke about the effect our fathers have on us. How having a bad or absent father has not only a negative effect on us, but distorts our perception of God. I shared how my experience with my own father also distorted my concept of what fatherly love is. In the Bible passage Paul prays for the believers that the Father (God) would be their true source of inner strength. That no matter what kind of father we have had, God is able to reveal the true essence of fatherhood to us with the result of giving us confidence and courage, as well as equip us to be the kind of fathers we should be. Teaching Bible to the “soccer guys” this morning. I am on the bottom bench in the dark red shirt. This afternoon may have been one of the most precious experiences of my life! For the past year and a half Sarah has gone once a week to a small children’s home to teach dance. Sarah has taught dance in one form another since she was about twelve years old. But to see her do for these kids what I have seen her do at home and to see the wonderful effect she is having on them through dance was wonderfully overwhelming. To protect their privacy, I won’t be posting photos, but how wonderful it was to be greeted with hugs from almost every single one of the thirty kids there and to see them engage this glorious art form so joyfully. As it turns out, my being here has coincided with a visit from the person from North America who is the liaison between the home’s sponsoring church and the home. Seeing the work through his eyes was really something. He has seen first hand the benefit this ministry has been to the children. I was able to see the difference that can be made in such a poor and difficult country. I think some of my cynicism was healed today. After the children’s home, we went to the market (another experience indeed!). When it was time to head back by “taxi” (small motorcyle). Due to some logistic issues, she asked me if I would mind heading back on my own, before I had time to answer, I found myself whisked away, riding as a sole passenger for the first time. Tomorrow I am due to speak at a church service in the town here. The pastor was my translator when Robin and I were here in 2012. I am really looking forward to seeing and working with him again. I concluded yesterday’s post by sharing a photo of one of the most beautiful trees I have ever seen with perhaps the best tree name ever, the Flamboyant. A row of Moringa trees on the YWAM base. The Hebrew prophet Ezekiel, chapter 47, speaks of how in the future when the Messiah sets the world to rights, there will be trees for healing, a notion picked up at the end of the Book of Revelation. Besides the wonderful (and still unknown or ignored) provision contained in the Merango, it is a taste (pun intended) of a bright and glorious future when Yeshua returns. Reminds me of so much of what God has for us even now that we either are unaware of or ignore. Yesterday I mentioned I was going to be speaking to some young guys who come to the base to play soccer. Every Thursday they have a Bible study. These guys have no church background, and so the Bible is very new to them. Before I gave the Bible lesson I prepared, I told them my own story of having a very troubled upbringing with parents who aggressively argued all the time and my resulting breakdown at age eleven and the panic attacks when I was eighteen. I went on to explain how as a Jewish person from Montreal, I knew virtually nothing about Jesus and that he fulfilled the predictions of the Messiah in the Old Testament. The same afternoon that I heard about all this for the first time I asked God to forgive my sins and asked Jesus to coming into my life as my Messiah. The panic attacks stopped and God completely changed my life (not without challenges). That’s the summary of the longer version I told them. I went on to the Bible lesson, where I spoke about how God’s rules for our lives are not oppressive, but free us to live a good life just like the rules for soccer free us to play the game effectively. But the surprise happened during the question time when several said they could relate to my upbringing. Worlds apart in so many ways, but the same pain. So I was able to encourage them to face the challenges of life through the power of God in the Messiah. What a blessing to see their earnest faces and to receive hugs from a couple of them. Today was beach day! Sarah knows how to drive like a Haitian. Sarah, her boyfriend, and I had a lovely day by the Caribbean Sea, chatting, eating a lovely dinner, and soaking in the waves. What a country of contrasts. Is it okay to hang out at a resort for the day in a country where most people eat one meal a day of rice and beans? Tomorrow, I am going with Sarah to the orphanage where she teaches dance each week. We are currently in the rainy season, which means it rains about once every day. My first evening here I don’t think it lasted an hour, while last night it was probably closer to three. But did it ever come down! At home in Ottawa we can get some severe storms, but I don’t recall anything this dramamatic. Is it the metal roofs making the rain louder or the palm leaves being whipped around giving me the impression that the wind was stronger than it was? Whatever the reason, it put on a pretty good show. Last night I taught Bible at the mission base’s weekly community service that is provided for the staff on site as well as anyone from the community who wants to come. Sarah said what I shared was very relevant to the community. I am so grateful to God when that happens, especially in a context of which I have so little understanding. My main theme was the hope of the resurrection and what that means in terms of valuing the creation. Speaking at last night’s community service, translated into Creole. This morning, Sarah’s boyfriend took me off base. Again, the taxi ride on the motorcycle was really something (see my previous post). I wish I had a Go Pro to share the experience with you. The drivers’ ability to weave in and out of the tightest of places is absolutely astounding! I am starting to think they may have superior depth perception. We went to his church which is currently having forty days of prayer and fasting, which is why they were having a service Thursday morning. 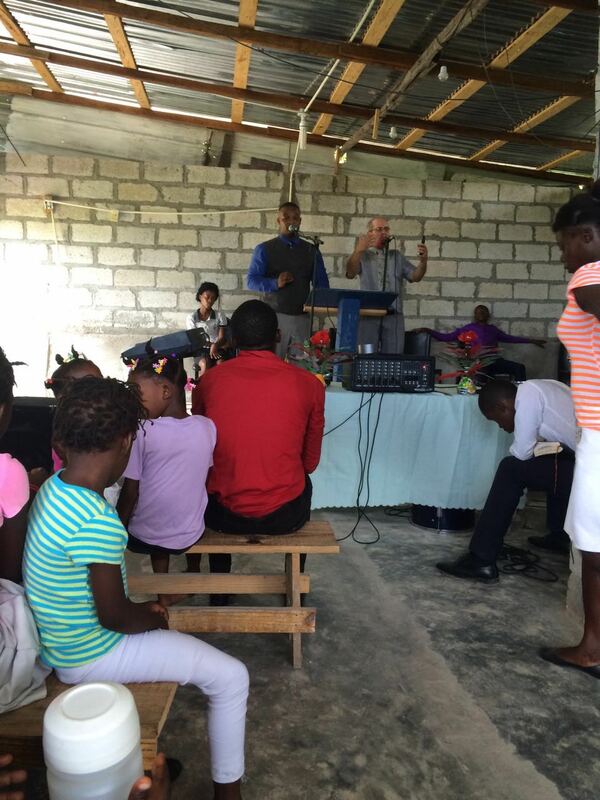 I have been told that Haitian church services tend to be loud. I was told correctly. Then we went to his house, which was quite nice. As we went here and there he would introduce me to people he knows. Everyone is so warm and friendly. I especially love the reaction I get when I smile back at the little children who stare at me. A few minutes ago Sarah told me that I will speaking this evening to a group of young guys who are here involved in some sort of soccer camp. There’ll be time for questions after, which I love to do. But what meaningful thing can I say to a group of Haitian young men? I have also just learned that I will be teaching at a Sunday morning service in town. Again, same thing. What’s a Jewish Canadian follower of Yeshua guy like me going to say to a gathering of people from Saint-Marc? Stay tuned! I want to close this post by sharing one of the more spectacular trees on the base. It is a Royal Poinciana, also called a (I love this!) Flamboyant. The flight yesterday from Montreal to Port-au-Prince, Haiti, went very well. It took me about an hour to get through immigration, baggage, and customs amidst much jostling and difficult communication (Je parle un peu Francais – I speak a little French. – though it’s been increasing rapidly). I was told later the hour was quite normal. After waiting for the person from the mission base to pick me up (an airport worker, seeing me looking lost, offered me to use his cell phone to call my ride at no charge). The drive to the mission base is something you need to experience to understands. Part obstacle course, part maze, I am grateful it wasn’t a demolition derby. My favourite was driving on the double yellow line as if it was a third lane, dodging scooters with multiple people, taps taps (public transport which are modified covered pickup trucks with side benches, filled to capacity with always room for three more), tractor trailers with their horns blasting, all in both directions. Not the best photo, but you might get the correct impression. It was really hot yesterday but hotter today, though so far today I am handling it ok. I am being housed in a very nice apartment. Power is supplied through a combination of city power (hardly ever these days I am told) , generator, and battery power). I had my first taxi ride today (something I managed to avoid four years ago). A Haitian taxi is a small scooter with a driver for hire. Personal space is almost a non-concept here as I was comfortably squished between the driver and Sarah. Most scooter (though they might be classified as small motorcycles) drivers don’t wear helmets). We zipped along on bumpy city streets zigging and zagging somewhat similar to yesterday’s drive with the wind in my face as I chatted with Sarah behind me and all sorts of sights, sounds, and smell around me. Can I be honest with you, dear reader? It was fun!! As we went to the local general store, it was so precious to see how many people know (and love) Sarah as she introduces me to everyone as her Daddy. As every minute passes, I realize more and more how worlds apart the Canadian and Haitian cultures are. I am supposed to teach tonight at a small community service on the base. Most who are attend are the folks that live on site (Americans, Canadians, and Hatians), though people from the town may come too. What can say to bless them when our lives are so very different? If you are a praying person, you know what to do! One last thing for now. Last night I was chatting with Sarah about the drive from the airport and what I observed to be extreme recklessness on the part of the drivers. She said part of the reason is that Haitians have no fear. I could get really phylisophical and psychological about that, but whatever is at the root of this, not to mention the fruits, it is such a contrast to myself, who was raise on a constant diet of fear. To close my eyes and picture myself in the midst of all that high-speed, near-miss driving, yet void of fear is so beyond anything I could dream of for yours truly. But, then again, the scooter ride today was fun! With Sarah and her boyfriend. Today I break an inner vow to never go to Haiti in the summer. But I do so, because it is clear to me that this is God’s will. Some months ago my daughter Sarah, who has served with the mission YWAM in Saint-Marc since the fall of 2009, developed a serious relationship with a Haitian young man. So now Dad (that’s me!) is going down to meet him. This will also be my first opportunity to see Sarah in her beloved environment. Robin and I were there January 2012,but Sarah wasn’t able to be there then. I have a sense I am going to see a more real Haiti compared to when I was last there. Besides the personal aspect, I am due to do some formal and informal Bible teaching. Not used to being a visible minority. Boarding began 50 minutes pre departure. I was made to understand this is normal for this Montreal flight. I hope to blog as I can.